I am an acupuncturist, herbalist, and massage therapist, as well as a mama to two amazing children. In our work together, my intention is to witness and support you, as a whole person, in your journey of healing. I offer tools and insight from my knowledge of holistic medicine, as a means to empower and encourage your own healing process. My practice is inspired by the body’s innate ability to heal and by a strong belief in our interconnectedness with the earth and each other. And Manzanita Wellness is created with the vision of being a center of healing, resource, renewal, community health empowerment, and connection. Some years later, I became interested in Chinese Medicine through learning about Five Element Theory and studying acupressure, and was drawn to the many interwoven modalities of this deep and ancient medicine that developed over many centuries of careful observation of the natural world. I was excited to learn another practical hands-on skill, attracted to the magical witchy knowledge within the medicine, and resonated with the intuitive model of humans as a microcosm of the planet or garden. I went on to study at American College of Traditional Chinese Medicine, where I graduated with a Masters of Science, and became a Licensed Acupuncturist. As part of my acupuncture and herbal training, I also studied Tui Na (Chinese orthopedic massage), and worked at the Women’s Community Clinic in San Francisco, the Haight-Ashbury Free Clinic, and the ACTCM Ear Clinic. I pursued post-graduate study in women's health, pediatrics, integrative herbology, essential oils (Aroma Acupoint), and qigong, among other topics. After becoming licensed, I worked at Berkeley Community Acupuncture before beginning my own practice at Manzanita Wellness Clinic in 2009, and formed Manzanita Collective with other healing practitioners in 2012. Along with practicing this beautiful medicine and creating community healing space, I enjoy hiking, dancing, reading, spending time with family and friends, connecting with spirit through ritual, prayer, and meditation, cooking, eating, and relaxing. Many people have asked me about this name for the clinic. The truth is, I went to sleep requesting dream guidance about the name for my new practice, and heard the name Manzanita all night in my dreams. Upon waking, I decided I liked this idea! Manzanitas are beautiful trees and shrubs native to the California coastal ranges and foothills. I have grown up loving their amazing radiant reddish wood that is in a constant state of evolution and transition, their incredibly graceful twisty turny dancing branches, laughing leaves and their scented white and pink blossoms. I love the tiny red berries for which they are named– manzanita means little apple in Spanish– and this makes me think of children, our own little apples. At the Tilden botanical gardens I was amazed to see just how many different kinds of manzanita exist. (I have also always loved their bigger cousins, the madrones, which apparently some Canadians call manzanita.) 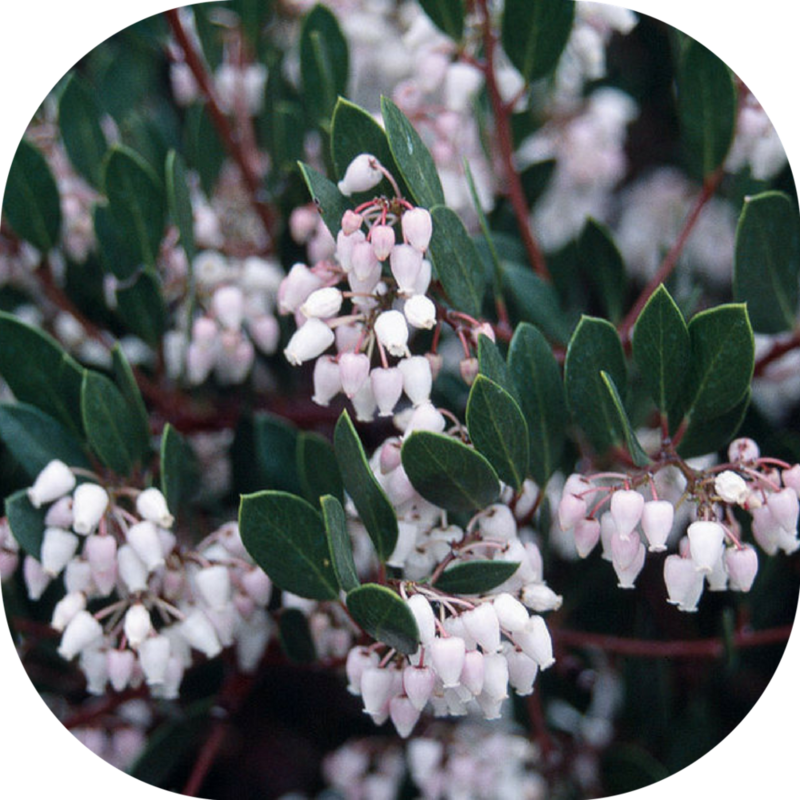 There are a few varieties of manzanita native to the Bay Area! It is used medicinally, addressing meridians of the Kidney, Urinary Bladder, Liver and Large Intestine, and used for various urinary, menstrual, respiratory, and digestive issues. Some parts of the tree are used as food, others topically to help with poison oak or other rashes. It is astringing, tonifying, stabilizing, restoring, clearing, vitalizing, and calming. Manzanita is one of those plants that strikes me because it seems so related to our humanity, with its branches that take their direction from the wind, its bark by turns as shiny and supple as a body in the rain, or scratchy and rough like an older tree in other places and the wildly different forms it has evolved to adapt in various locales. Manzanita inspires us to remember we all can take our shape in joyous response to whichever way life moves us, embodying paradoxes of strength and flexibility, evolutions in texture and form and making a home where we find ourselves. Interestingly, the plant spirit and flower essence of Manzanita is all about joyous embodiment, and the integration of the spirit with the physical body.